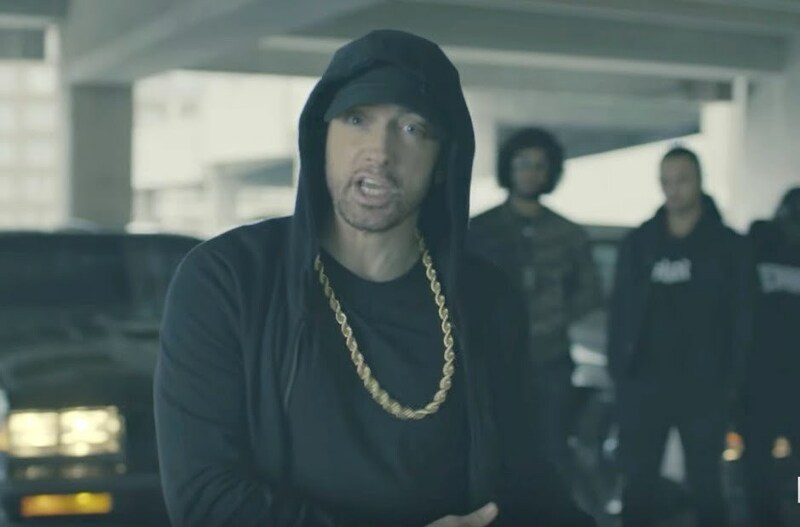 Eminem, aka the GOAT, went HAM on President Trump during his 2017 BET Hip Hop Awards Cypher freestyle. The rap legend held nothing back when he stepped up to the camera under a parking deck with his crew standing in the backdrop with vintage cars. The moment was ripe for all things happening in the country politically and socially, and vintage Eminem once again came through, showing hip hop is alive and well. From Trump twitter fingers to war with NFL players, Em touched on every topic in an expletive-laced freestyle that will have the President fuming by tomorrow morning. Eminem even called out his fans who are supporters of Trump telling them to decide who they rather support and if its a draw and they can’t decide, then they get a big FU and a middle finger at the end. Another iconic moment in the BET Awards Cypher was when Eminem held up his fist in support of black NFL players who are using their platforms as star athletes to protest racial injustice in America. This BET Cypher will go down in history as one of the greatest of all time for its share impact on the conversations going on in the country right now about race and inequality. Eminem is the right man for the right moment and hip hop will never forget this moment.